Investigator Weapons, volume 1 is for Classic Call of Cthulhu of the Twenties, and is a comprehensive collection of weapons available to stalwart investigators of the Cthulhu Mythos and their crazed cultist opponents. Investigator Weapons covers handguns, rifles, shotguns, submachine guns, machine guns, flamethrowers, melee weapons, explosives, and special ammunition; and gathers together all the spot rules for injury, environmental conditions, and firearms combat in one place, as well as introducing many optional rules for enhanced play. Keepers are not forgotten either. Typical weapons for non-player characters are suggested, as are likely weapons for cultists from around the world. A Keeper's chapter examines the consequences of magic on firearms and ammunition, and the effect of firearms on Mythos creatures. 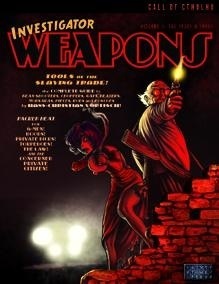 Sign in to start a discussion about Investigator Weapons, Volume 1 (Call of Cthulhu)!